Reports from entrants in the 2012 ILLW event. For the ILLW weekend we activated the Cape Hatteras Lighthouse at Cape Hatteras National Seashore in North Carolina, USA. The weekend has come and gone and we had a great time. With permission from the National Park, we erected our tent adjacent to the lighthouse and went on the air with special event call W4H. We erected a 20/40 meter crossed inverted V and an 80 meter dipole nearby. They sure looked small next to the 200-foot lighthouse. Operating two stations, we sometimes called CQ and also searched around for other lighthouses on the air. In all, we contacted one lightship and 18 lighthouses in the USA and Canada. In addition, we talked to 58 other stations, some notable ones being the Battleship New Jersey, the Indianapolis Speedway, and the London Olympic station. When lighthouses were contacted, we wrote their names on a whiteboard for visitors to see. Speaking of visitors, we talked to 200-300 of them and they really were interested in our activity. They were in a lighthouse frame of mind and thought it was cool that we were talking to other ones. There were also a couple inactive hams who said they were inspired to get back on the air. Although rain was expected all weekend, it held off. On Sunday afternoon, though, we had to shut down early because of a waterspout in the area and an approaching thunderstorm. We tore down in a record half hour. By then the storm had bypassed us but we were satisfied with our results and pleased with our experience. The Tableland Radio Group, TRG, took part in the 2012 ILLW for the 8th consecutive year from the same location on Grassy Hill near the old light , which was established in 1885 and is still operating. It was once again a pleasant experience with the support of Cook Shire Council via the Mayor, Mr Peter Scott, and locally is known about by the community. We had 10 members of TRG travel about 300kms up to operate and set up was commenced early on saturday with a dipole, and FT897D operated from a GRM battery charged via 40watt solar panel. It was pleasing to once again to experience the family friendly athmosphere that has become a part of this unique event. We had quite a lot of contacts, most within Australia, but also New Zealand, India, China, and the USA. The deep fades were the only "down side" of the weekend and it was commented upon by several stations. Numerous visitors from near and far come by and we had a visit by the Mayor who was keen to inspect "his station". The Australian football legend Shane Webcke also paid us a surprise visit.Visiting HAMS were Laurie VK3HAO, VK3BCR and Dale VK4DMC. The TRG now has a permanent plate at their operating position recognizing the ILLW and the TRG efforts over the years. Thanks must go to the organisers Kevin VK2CE, Ted W8TTs and Jim VK3PC as without your efforts this event wouldn't be the great success it is. Amateurs that took part were Wilf VK4ZNZ, Alan VK4HBN, Ross VK4AQ, WayneVK4ARW, Val VK4FAIR, Pat VK4MUY, Dave VK4FUY, Mike VK4MIK XYL's Helen and Keran. ILLW - LIGHTHOUSE WEEKEND, CAPE BYRON, EVANS HEAD. An excellent weekend was enjoyed by members attending the ILLW exercise at Cape Byron and Evans Heads. Fine weather, a bit windy Fri and Sat but beautiful fine summer days. Many excellent contacts were made with other lights and interested operators. Thanks to all who took part and to National Parks and Councils who made it possible. Evans Heads pics to be added when received. The 2012 lighthouse weekend fell in the middle of a heatwave in west-Europe. Although we were lucky, being inside an old lighthouse with 3 feet thick walls and hardly windows, it was really warm. Or better: hot. The bands were also hot this weekend: it seemed there is a growing interest in the lighthouse-weekend. There were really pile-ups to handle. We were very happy we were able to work many other lighthouses and interested HAMs and share our experiences. This year we used a windom-antenna (10-80m) and a seperate vertical end-fed antenna for 20m. For 2 meter we used a Diamond X-50 antenna. Conditions on 2 meter were extremly good this year: we nailed quite a lot of avid 2 meter-users. 40 meter was also in a pretty good shape: worked Trinidad and Tabago and several HAMs from USA and Canada. On 20 meter we worked some VK: 16.250km away from our old lighthouse (NL0038) in the city of Harderwijk. Maximum power we used was 100 Watt, but often less then 20 Watt. TRX were Yaesu FT-748 and Kenwood TS-590. Thanks to the hot weather and the hard work we lost some pounds. More important: we enjoyed every minute of the event! Had a very successful of the Sand Point Light (VA3QV and VA3PCJ Operators) on Saturday August 18 th. had a great time. It is a very friendly event. We have booked the accommodation again for 2013. Lighthouse AU0024 for 2013. QSL via Buro. It will be 17/18 August 2013. Umpqua lighthouse in the background, the Coast guard museum on the Left. The tower and beam are portable via trailer. 30 minute settup. The 2012 activation of Currie Light House went very well. Over 160 VK and DX stations were contacted across the weekend. Of the 160 Contacts 23 Australian Light Houses were logged and 3 USA Light Houses were added to the Log also. Contacts included the Light Ship” MV Don” in Sydney Harbour (currently being restored) / Tasman Island (VK7FB) and VI5CW at Cape Willoughby, Kangaroo Island. The weather was not as kind as last year with solid Bass Strait “breezes” buffeting the Light on Friday during set up and Saturday. Sunday provided much better weather conditions. This year I was joined and assisted by Dale VK7YR……. Thanks Dale! I would also like to thank Sue, Richard and Michael from the King Island Historical Society, Mark from the KI Council and Ondrea from King Island Rambles. Without their assistance and support the activation would not take place. After some prodding from Steve VK5AIM, I decided to give it a go this year for my first entry into the International Lighthouse and Lightship Weekend. Steve agreed to join me for just the Saturday. As usual I left it to the last minute and didn't make any arrangements with the Maritime Museum staff. So we rolled up at the lighthouse at about 10 AM but found it wasn't practical to set ourselves up right at the lighthouse. Steve knew there was a likely place immediately across the Port River from the light so we drove over the Birkenhead Bridge and found the spot quite close to the water's edge with a most suitable wooden railing to support the antenna. The Lighthouse was originally located off Semaphore Beach which is now in suburban Adelaide. With the advancing development in the 19th century, the lighthouse became redundant and it was moved to Port Adelaide to be set up as a tourist attraction. It is now under the control of the South Australian Maritime Museum. The weather on the Saturday was a bit variable with some nice sunny breaks between cloudy conditions and a few light showers. There was a light to moderate breeze but not enough to worry the squidpole antenna. Fortunately the heaviest of the showers was at lunchtime. We threw the obligatory sheet of Field Day plastic over the gear and retreated to the car to have our lunch. While we did so a one legged seagull landed on the bonnet and watched us eat. They certainly know when tucker is around. The equipment setup consisted of a Kenwood TS2000 radio powered by a 110AH deep-cycle battery and a 9m squidpole antenna of the VK7YY design. The vertical antenna was complimented by a single 10m wire laid on the ground as a counterpoise plus for good measure, a slide hammer earth stake of the VK3XSW design; see Amateur Radio Jan/Feb 2012. A small picnic table and two comfy chairs and we were all set. Our first contact was just before 11AM with VI5CW at the Cape Willoughby Lighthouse on Kangaroo Island with Lesley VK5LOL on the mike. We contacted a further 15 lighthouses during the afternoon on 40 and 20m. The squidpole works particularly well on the latter band and we were able to have a QSO with F5CAC in north-eastern France. In all, we contacted lighthouses in four other Australian states as well as VK5. We passed the mike between us and each had a contact with each of the stations contacted. Several interested passers-by stopped to ask what we were doing and we were able to explain about Amateur Radio and the Lighthouse Weekend in particular. The big advantage of setting up in a populated area means there are more people around who may wish know what we are about. An additional advantage is the proximity of the Birkenhead Hotel. I'll say no more. At about 4:30 in the afternoon, we decided to call it a day as the flow of contacts had almost dried up and the south-westerly breeze was becoming decidedly colder. It was a most enjoyable day not a massive exercise as field operations go but a great pleasure. I'll certainly give it a go next year if at all possible. With two local ham’s we had to clime the hilltop with a truck full of equipment. After two hours we fixed our radio station on the direct spot of the lighthouse “ North point”. The setup was as follow. Antenna a FD4 off center dipole 60 meters above sea level, a FT2000 in combination with a Expert 1 K, two generators@4Kva. We started on 17 meter and in no time we where into a huge pileup. When 17 meter band closed we worked 310 stations in 27 country’s. VK,ZL,JA,USA and many more in Europe and Central and South America. This was a great success and many people ask us to come back on the next year event. We had no visitors because of the isolated and difficult to reach place, the media will put an article in the local newspaper. Another ILLW has come and gone for the Cape May County Amateur Radio Club at the Cape May Lighthouse, Cape May Point, NJ, USA. The weather was glorious and the bands, at least 40 meters, cooperated. I'm sorry to say that the other bands were not particularly productive. Over the two days we had 17 club members participate and one licensed non-member. We had numerous visitors viewing our activity. We look forward to next year's event. Here's my activation report for your nice website. Last thursday, I decided to take part into the International Lighthouses and Lightships Weekend and decided to activate the nearest lighthouse, the Cap-du-Bon-Désir lighthouse, located at 25 kms north of Tadoussac, Qc. For this last minute expedition, I decided to use my SOTA setup, HB1B, LiPO batteries and Par end fed. I made 5 contacts in somewhat difficult condx. Highlight is a QSO with W8COD, WWII USS Cod submarine station! Also in log are KE4RUN/QRP, K2QMF, VO1DD and N4XAT. Some awesome whales watching session that I cought on video are also to mention. I did copy EM0LH but did not manage to contact him..
Well we did it this year, myself Kevin vk7hkn, Peter vk7kpc, Alan vk7an and Geoff vk7gw and not to forget my wife, Lyn braved the wind and cold to set up for the event. It is a fantastic place Eddystone Point a long way from civilisation no phone coverage so no Internet but who cares we were there to work a lighthouse. Being first there I quickly set up the 9m squid pole and the first contact came through - Point Lonsdale. Peter Alan and Geoff arrived not long after and once Peter set up the serious business started. Throughout the day contacts were made and Signal strengths were always 59+. Alan and Geoff left after a couple of hours as they got a little cold and a nice warm house at St Helens was waiting, but we stayed and started packing up at 4pm and on the road by 5pm for a 2 hour drive home dodging wildlife. We had worked around 60 stations including zl lighthouse so a very successful day. Can't wait for next year! Wanted to pass along a link to our media page on the club's website where we've posted links to two local TV news interviews. Keep up the good work organizing the event! The Wireless Society of Southern Maine took part in the 2012 ILLW for the second consecutive year, this time operating from Wood Island Lighthouse (US0141) in Biddeford Pool, Maine USA. Five members, including Thom Watson W1WMG, Sam Webber N1WIG, Dave Wood KB1FGF, Rory McEwen KB1PLY, and Tim Watson KB1HNZ, plus one visitor from Canada, Harold Rosenberg VE2HRP, made the two mile trip to Wood Island to participate in the event. WSSM members rode the "Light Runner," a specially designed boat used by the Friends of Wood Island Lighthouse to ferry folks to and from the island on tours, three days a week during July and August. Once on the island we had to transverse a half-mile long boardwalk over woods, fields, swamp and rough terrain to get to the keeper's house and light tower. The lighthouse has stood proudly for over 200 years. The island is quiet and deserted most days, with the exception of the seagulls, butterflies, and deer that call it home. The station we setup was a Yaesu FT857D, and an Icom IC7000, both running 100% battery power, into a 40 meter dipole, and a BuddiPole rotatable dipole. We operated from 1350-1828 UTC, making 97 contacts to 7 DXCC entities, many of which were other lighthouse stations. The expedition also qualified as IOTA #NA137 and USi #ME103S. Everyone had a great time, and we can't wait till next year! To see more photos of the event, including an interactive panorama, please click here. A ctivity LH Week end Special Event 18/19/2012 CALA NANS CADAQUES SPAIN LH SPA-075 ILLW ES-33 dme-17032 Equipments Icom 7000 100 Watts Vertical 1/4 Wave 40 Meters and others Bands The activation of this lighthouse is very special because no car access, are 3 km walk with backpack and complements the operator's back, I consider excellent experience and be back next year to be in this great event. The members of the Cape Town Amateur Radio Centre(http://www.ctarc.org.za) once again activated the Green Point Lighthouse ZA0006 in Cape Town, organized by Rob ZS1SA. This is very centrally located on the western side of the city overlooking the approaches to Table Bay and the harbour and is the oldest lighthouse in South Africa, first lit on the night of 12th April 1824. The light was electrified on 31st March 1929 and the present 400 watt metal halide lamp and third order optic produces approximately 850 000 candelas. We are graciously given the use of the lighthouse, (which is the Headquarters of the Lighthouse services) and all the facilities by the National Ports Authority, which is very highly appreciated, we extend our thanks to the management. The propagation on HF was variable, in total we made just over 180 contacts and a lot of interest was generated, the weather on Saturday was particularly pleasant and the antenna on the lawn drew the public’s attention. 73 to all, see you on the air next year. The 18th and 19th were a few nice days in the Netherlands. This is our second experience activating the Punta Tuna Lighthouse(PR0008) in Maunabo City,Puerto Rico during the International Lighthouse Lightship weekend. It was a spectacular experience for us. We received a lot of visits from tourists and other radio operators who transmitted from a lighthouse station for the first time. We realized excellent qso’s in 10,15 and 20 meters bands. On Sunday morning we did a net between different local lighthouse stations in the 40 meters band and it was a complete success. The Punta Tuna Lighthouse is located at the southeast side of Puerto Rico. From this lighthouse people can see Vieques Island and the light in the evening coming from Vieques lighthouse ,too. We hope on next year 2013 we can activate this lighthouse again in Maunabo City. It was a unique and special experience. In addition,the newspapers in Puerto Rico assigned an important place to this historic event. Greetings from Peter (DL4ABB) and Hartmut (DB6LL). Thanks for so many beautiful Contacs with Lighthouse and Lightship Stations. The Event take part in the hotsummer season of this year. We hat sometimes over 40 drgrees in our tent, but we had lots of fun. We carry two longwires, one Vertical and 3 Shortwave tranceivers in the tent to talk to you. So, thank you to you all and see you next year. In 2012 the Manly Warringah Radio Society once again activated the Barrenjoey Lighthouse (AU0046) which overlooks Palm Beach in the northern part of Sydney. The MWRS team clambered up the hill early Saturday morning to set up a 40 Meter Dipole, a separate 3 beam TH-3 Yagi and a multi-band whip. By 10 AM we were on the air and making our first contacts. A couple of highlights would have to be the Maritime Mobile stations of PE1OAD who was on a container ship heading from Melbourne to Newcastle and VK2BTT which was the call sign being used by a team operating from the MV Cape Don, a ship historically used in the maintenance of navigational aids including manned lighthouses. All in all, we made 203 QSO to 177 unique stations spread across 12 country prefixes, using a variet of modes including SSB, CW, FM and D-STAR, and in the end we talked to 41 separate lighthouse stations. We had multiple radios in operation at various times over the weekend, including a Codan 8528, Icom IC7000, Elecraft KX3, Yaesu FT-857D, Yaesu FT-7800 and more handhelds than you can poke a stick at. Hello Kevin and greetings from Portugal. We have a nice and warm weekend in this fantastic event from Cape of Roca Lighthouse – CR6LH. Martin County Armature Radio Association and Boy Scout troop 721 from Palm Beach Gardens. We had over 25 members from the three groups and we are looking forward to next year. Set up early Saturday Morning at the Light House on the porch. Morning tea with cookies from Mike's (KV4MS) XYL. Archer Point is located some 300kms north of Cairns in Far North Queensland on a very exposed headland. TREC member Dale VK4DMC travelled up from the Atherton area, a 600 km round trip. Archer Point is a very isolated location with no facilities available so VK4XQA had to be totally self sufficient. Due to the very windy location and no suitable places to affix antennas the station was operated from a vehicle using an IC-7000 at 100 watts into a custom designed Terlin vertical antenna mounted on the front of the vehicle. The TREC special commemorative call-sign, VK4XQA, was used for the event. The first amateur radio call-sign issued in Queensland Australia was XQA, the call was issued to Marcus Brims in Mareeba, Queensland in 1914. TREC members were instrumental in acquiring the original spark gap station that was used by Marcus Brims XQA and having it permanently on display in the Mareeba Heritage Museum in Far North Queensland. The letters of the first call-sign stood for X-experimental, Q-Queensland A-The first licence issued. Conditions proved to be reasonable on 20, 40 and 80 metres, albeit marginal at times due to poor propagation. 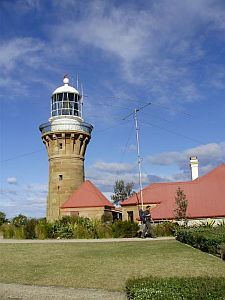 A total of 53 stations were worked including 24 other lighthouse amateur radio stations around Australia, New Zealand, United States of America and China. Lighthouse stations in every state of Australia were contacted with the exception of VK1 and VK8 who did not have a lighthouse station active however VK4XQA did work hams in all states of VK as well as P29 and ZL. Rumour has it that there will be a lighthouse activated in Alice Springs next year for the Henley on Todd regatta. The Tableland Radio and Electronics Club with over 30 members has been established for over 24 years and is based on the Atherton Tablelands inland from Cairns in Far North Queensland. Another TREC member, Mal VK4MSS and his XYL Marianne paid a visit to the lighthouse on Saturday. Rockhampton and District Amateur Radio Club once again activated the Cape Capricorn Lighthouse (AU0059) complex on the Central East Coast of Australia for the ILLW, thanks to the generosity of Bruce and Glenice Kingston of Cape Capricorn Escape, who lease the site. The Club call sign VK4WIR was used. Associate member, Rod Cecil, assisted by Jeff Bykoff supplied the maritime transport for the eight hour trip from and to Rockhampton in his 45ft cruiser and was host for the one week visit. Mike VK4LMB, Clive, VK4ACC, Len VK4WAL and Les VK4VIL set up and worked comms. Warren Andrews who is studying for his F call also made the trip and worked on the side. Cape Capricorn Lighthouse is on the NE point of Curtis Island OC142, which was well sought after by IOTA enthusiasts. Propagation was variable during the weekend but we experienced some great openings to Europe and the USA, both short and long path. One opening on 20m allowed one hundred and sixteen calls to Europe during a ninety minute period, with Mike really working overtime on the pile up, considering this is not a contest. Of special interest was a couple of calls to “pedestrian mobile” operators in England who were only using 10w! Well over four hundred HF calls were logged over the two days, including forty six VK lighthouses and twenty overseas lights in Russia, USA, Croatia, South Africa, Germany, Holland, Puerto Rico and New Zealand. The Cape is approximately 90m above sea level, virtually surrounded by water, with sheer cliffs all around. We reckon it’s worth a Kw! Another top trip! Many thanks to the organisers and we have already registered for 2013. The ILLW is a major event on our Clubs calendar and activity on the island and elsewhere is closely followed by a large number of members back home. This was my first participation on the event operating from a lighthouse. We travelled approx. 60 Km from home at Port Elliot to Cape Jervis on the tip of Fleurieu Peninsula, overlooking Backstairs Passage, between the mainland and Kangaroo Island. I believe this was the first activation of the Cape Jervis lighthouse in this event, as it is not listed in the archives going back to 1998.
International Lighthouse Weekend gives me a chance to indulge two hobbies at the one time – Radio and Sailing. A few years ago I decided that sailing to, and anchoring alongside normally inaccessible lighthouses would add some challenge to the venture, as well as be likely to generate some pileups. Like Contesters and Dxpeditioners, I enjoy the pileup, and am rarely known for much rag chewing. In previous years I’ve sailed to Hyskeir Light, - a group of rocks off the island of Canna, and to Skerryvore, a light on a rock 12 miles south of the island of Tiree, and a number of lesser more sheltered lights. For 3 years I’ve had Dubh Artach on my target list, and this year I was determined to try again, but also determined to be able to come back alive. Dubh Artach is an isolated group of rocks about 14 miles west of Colonsay and 14 miles south of Iona. There is some shallow part bwteen rocks that on the chart suggests an anchoring place, but it would all be subject to the weather. Last year, I sailed near here, in a single-handed journey from Oban to Glasgow, west of Islay and round the Mull of Kintyre. It was most unpleasant, in fact so rough that I diverted round Islay and went south in the sound of Islay between it and Jura. The waves that day out west of Colonsay and Islay were about 5-6m height. Uncomfortable sailing, but impossible for anchoring near rocks! This year I failed for the third year to activate Dubh Artach! As in previous years I had backup targets, and this year Ruvaal Light, on the north end of Islay was the secondary objective. Ruvaal can be accessed over land (unlike most of those I’ve activated), but it’s a 5 miles walk from the nearest road at Bunnahabhain Distillery. It’s a traditional Stevenson built Stone tower of 34m height, built in 1859. It was made automatic in 1983. Along with son Matt, MM1EUI, I sailed from Oban on Friday morning to Colonsay staying overnight at Scalasaig Harbour. Next morning we set out thinking we’d be right for Dubh Artach. The forecast wasn’t that great, but was not prohibitive. But as soon as we were out of the harbour, the wind picked up and it was obvious that if we had that much wind inshore and the wave height we did, that Scotland’s most inaccessible light (as I now think of it) might have to wait another year. Ruvaal it was to be then. We sailed towards Jura and then south to Ruvaal, where anchoring on the sandy ledge along the edge of the Sound of Islay, we managed to work a few stations. Starting operations at about 1100, 262 stations were worked on 15, 20 and 40m. Its not a contest, so QSO rate isn’t relevant for Lighthouses, but this was a disappointing number. Conditions didn’t seem great, with a few Russians and a couple or PY’s being the only non-Eu stations worked. On the way home on Sunday we stopped at another rock site lighthouse, Skervuile, which is off Craighouse in the Sound of Jura. It’s a tiny rock, and while it’s a challenge to land on it, anchoring proved more difficult that I’d expected. So, the weather being very calm that day, we just hove to about 100m off and while Matt watched our rate of drift, I added a few to the log, mainly other lighthouses, and later that day we headed for Oban and home. Another year, another lighthouse, but maybe 2013 will be the year for the elusive Dubh Artach. AT8LH at Mahabalipuram Light House 2008, AT8LHC at Kadalur Point Lighthouse 2009, VU0LH at Surathkal Lighthouse,2010, VU9LHA at Alleppey Lighthouse, 2011 and VU9LHF at Vypin Island Lighthouse, December 2011 and the latest one for this August 2012 from Minicoy Light House with very unique callsign VU7M of Union Territory of Lakshadweep. This year, the “Islands on the Air” (IOTA) group of the Radio Society of Great Britain (RSGB) is celebrating the Golden Jubilee of the IOTA programme. The World Flora and Fauna WFF group, which impresses upon Green Planet philosophy, approved the addition of the “Lakshadweep Marine Biosphere Reserve” as the 103rd entity in India, for amateur radio activation. Activation of World Lighthouses on the Air WLOTA 2958, All these programmes were completed along with 66th Independence Day and Ramzan Festival celebrations by the Bangalore Amateur Radio Club group at Maliku Atoll of Minicoy. The group arrived in two groups of three operators on 13th and 19th August, with all the equipments. The first group installed the set-up at the Minicoy Light House on 13th itself and started telling the world about these events through radio contacts and via the internet also. This group gave HAM demonstration to the Principal, Teachers and the Children of the Jawahar Navodaya Vidyalaya of Minicoy on 18th August. The students and the faculty were told about the peace time role of amateur radio as scientific hobby, and being a resource at times of natural calamities and disasters in providing Emergency Communication. They showed lot of interest and we anticipate that this hobby is taken up by citizens of Lakshadweep very soon. The Deputy Collector of Minicoy, Shri. Anoop Thakur, took a lot of interest in amateur radio and visited the Special Event Ham Station set-up at the Lighthouse and at Tuna Canning Jetty area, inspite of his ill-health and rough weather on the evening of 21st August. His vast knowledge about the use of this mode of communication at all times, the various questions he posed of security and other safety measures were eye openers. He appreciated the efforts of Amateur (Ham) Radio Volunteers in this short visit to Minicoy Island. We anticipate that this hobby would be taken further to assist in Disaster Management and building up the useful resource amongst School and Villages of Minicoy. With more than 5000 two way contacts made and with more than One Hundred countries by six operators team, this is a record of sorts by a single Indian group, achieving so much. ILLW 2012 was a great experience for the team of DM2C/LH (DARC S54 - Group Chemnitz). The 5th At it - fun and interesting connections in CW, SSB, PSK and ROS! Much greetings from the one and only lighthouse in Saxony - in Moritzburg (DE 0021) - 500 km away from the coast! Not optional conditions on HF but for temperatures of 38 0 C - was all good fun! smoothly and also for so promptly answering all my e-mails. our equipment in a celler like structure next to the lighthouse. It was a beautiful weekend: lots of sun, lots of fun and lots of QSOs! The Limerick Radio Club participated in the ILLW weekend from Loop Head Lighthouse. It was the first time that the lighthouse was activated by the Limerick Radio Club for the ILLW event and it proved to be very successful and enjoyable. The clubs newly acquired telescopic mast got it’s first formal outing. Two stations were operated one from the base of the lighthouse and the second from the light keepers lookout room. Antennae consisted of an A4S, an A3WS and two G5RVs along with the club ICOM 756PRO, Kenwood TS-940S, SCAM telescopic mast and the club tilt up mast. Contacts were logged using the Win-EQF software. Altogether, twelve LRC members participated at various times over the weekend. Activity started at midnight on Friday with several QSOs into North and South America and continuing through Saturday into Sunday evening. The log showed 1440 unique call signs with a total of 1532 QSOs worked to 64 countries - a good weekends work. Thanks to all who participated. On Saturday, August 18th the Thousand Islands Repeater Club participated in the 15th annual International Lighthouse and Lightship Weekend (ILLW) by setting up and broadcasting from several amateur radio stations at the Tibbetts Point Lighthouse in Cape Vincent NY. The ILLW, held annually on the 3rd full weekend in August, was started in Scotland in 1993 as a biennial event to bring attention to Scottish lighthouses. This grew into the international event it is today in 1998. This year over 470 entrants from 47 countries participated. The Thousand Islands Repeater Club (TIRC) made over 50 contacts with 7 different licensed ham radio operators over the course of 7 hours of operating time. Contacts were made with lighthouses located as far away as the Netherlands and Alberta, Canada (and those were made, one right after the other!). Other contacts included Fire Island Lighthouse, Lorain Harbor Light in Ohio, Cape May Lighthouse in New Jersey, Lightship Nantucket in Rhode Island, and Point Vicente, California. In addition to the radio contacts made, the TIRC had several dozen curious individuals stop by to ask about the antennas that were set up and to talk about amateur radio in general. Overall, the day was a complete success and we are looking forward to participating in the 16th annual Lighthouse and Lightship weekend next year! Many thanks to the Town of Cape Vincent, the Tibbetts Point Lighthouse Historical Society and Hostel International at Tibbetts Point for allowing us to set up our antennas and radios at the Tibbetts Point Lighthouse. The Genoese chapter of Ari is participating to this event since 1998. For us ILLW is 'THE' summer event. Traditionally the activation is held in the 'Lanterna' , simply the most important light house of Italy and also the symbol of Genoa. Anyone taking part to the activation is very proud to be there and to have the opportunity of being aside this part of the story of our City. Formerly on the Air as Iq1l - since last year as II1L. This year the lighthouse was not accesible due to restoration works, so we decided to be on Air from the other light house of Genoa , i.e. the light house of Punta Vagno - as II1PV (please see also on qrz.com). Good participation of members (as usual for this event) and quite a good result in terms of qso (more than 800 in total). Very nice weekend we had there, with a hot sun for both days but also a pleasant sea breeze able to refresh the operators during the hardest and weaker Qsos ! The activity this year was helped by a good propagation which enabled good contacts also across the Atlantic to both North and South America. Also Central and Southern Africa were contacted. We operated in HF and VHF phone and CW , the highest satisfaction was given by a very nice qso with Algeria in 2 Meters band. We'll keep good memoery of this event and are all looking forward to participating to 2013 edition ! This is the second year the Nashoba Valley Amateur Radio Club has participated in ILLW (N1NC ILLW US0116.) This year nine members of our club travelled ~160 miles (257 km) to the Highland Light in North Truro Massachusetts USA. With heavy overcast skies on Saturday and much better weather on Sunday we enjoyed the good company and many visitors. We operated Field Day style once again as we alternated between a 20M Slanted Dipole and a 80M, 40M, 20M, 15M, 10M Fan dipole, both hanging from the railing of the Lighthouse. Our transceiver was an ICOM 746 Pro connected to a Laptop running N1MM as our logging software. While the band conditions for us were not quite as good as last year we still made 80 QSOs. We did manage to track down a major noise source in the lighthouse that contributed to making less QSOs this year. Turns out the battery charge controller at the lighthouse was very noisy. We have already started making plans for how to fix it for next year. This non-contest operating event allowed us to make contacts in a leisurely fashion. When we weren’t operating we spent time speaking to the public that stopped by; as we were positioned within 10 feet of the entrance to the Lighthouse tour! We took this opportunity to promote Lighthouse preservation and to discuss Amateur Radio. A special and unique QSL card is has been created to commemorate this event, the second in a series. Let’s hope you are one of the lucky ones to receive it. Many thanks to Bruce K1BG for organizing NVARC participation in this event. We are looking forward to this being an annual club event. We all had a wonderful time here at the lighthouse NL-0014 of Egmond aan Zee. A sunny and warm weekend and a lot of contacts with other lighthouse/lightships this weekend. We put up the antenna’s on Saterday morning and finis the event Sunday afternoon with a well earned dinner at a local restaurant, all together. Active on HF, VHF/UHF in SSB, CW, FM and PSK. PSK station; HF CW/SSB station; the lighthouse NL-0014; mounting the VHF beam and vertical on top of the LH; view from the LH at the beach down below us. Next year will be our 15th year at this event, so we have something to celebrate then! Thanks for all the work you do and we wish you good luck! See you all next year! Best 73 from the crew of PA6LH. Again for the Second year in a row saw the Club members erecting a tent on Friday night after the short notice after asking for approval from the Bunbury Port Authority to utilize the Casuarina Lighthouse premises again so the Club could participate in the 2012 ILLW. A great discussion was held on the Friday with the HSEC and Community officer from the Bunbury Port Authority which has developed into some great news that from now on the ILLW will be recognized as a yearly calendar event between the BRC & BPA not only for the enjoyment of the BRC but with expressions of interest from BPA that it may take the path to make the occasion an open day for the public during the ILLW. Some early planning in 2013 and discussion will continue to see the Bunbury Lighthouse open to the general public to visit the lighthouse and communicate with the BRC members while contacting as many Lighthouses during the event. This is what the weekend is supposed to mean to all of us and the BRC are very grateful to be a part of it. As for the 2012 ILLW were able to achieve 28 positive contacts to lighthouses, one Light House we believe was in India? 2 contacts with the same Lighthouse in the U.S. and as hard as we tried we achieved 3 contacts of the 5 Lighthouses New Zealand. Of this we made contacts to 10 Lighthouse using only 10watts. We made a further 68 contacts to stations with the furthest away being in New Mexico. Bring on 2013 ILLW. 73’s from The Bunbury Radio Club. We had a terrific time, and unfortunately the weekend went too quick. Here are some photos, and also an interview with Ashley Walsh on ABC Adelaide 891. The 2012 activation from Ft Liefkenshoek Range Front went very well . The location were not so good Ft Liefkenshoek is in the haven port from Antwerp surrounded with many big factories and big electric line very close by what giving many QRM on the bands . Thank you very much for all that took part and call in .